The What: Neutrik USA has launched opticalCON MTP24, a 24-channel fiber optic connection system based on MTP data connectors. 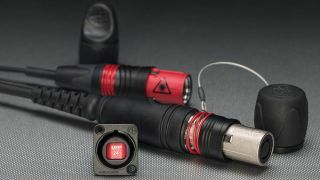 The What Else: The opticalCON MTP24 ADVANCED cable connector features a robust metal housing and heavy-duty strain relief. The connector’s automatic dust shutter protects the fiber from contamination and minimizes maintenance. For less rugged applications, opticalCON MTP24 LITE cable connectors are also available. Cable connectors can be factory terminated onto a variety of qualified multimode and single-mode (PC and APC) rugged cables. The opticalCON MTP24 chassis connector accepts a standard MTP breakout cable at the rear, facilitating easy adaptation to LC, SC, or ST optical fiber connectors. The built-in dust shutter ensures minimal maintenance. The sealing gasket provides color coding and IP protection. opticalCON MTP24 conforms to the IEC-61754-7 standard for interface dimensions for MPO-type (Multi Push-On) connectors as widely used in the telecom and data technology industries. Cable and chassis connectors are dust and water resistant per IP65 when mated and can be cleaned easily without any special tools. The Bottom Line: With its small form factor and robust design, opticalCON MTP24 is well suited for long cable runs and point-to-point wiring where high fiber counts are required. The system, based on Neutrik’s successful opticalCON QUAD, is optimized for broadcast, pro AV, and industrial applications. The opticalCON MTP24 cable and chassis connector products will be available Q2, 2017.